Humans can inflict unimaginable horrors of cruelty upon animals. Thankfully other humans — better, kinder, compassionate humans — can lift those animals that suffer at the hand of the unscrupulous out of deplorable conditions and into a life that, though not what nature intended for them, is the next best thing. The documentary film LION ARK chronicles cat rescue on a grand scale. BIG cats. As in African lions held captive, tortured, neglected, underfed and abused in all manner of ways by the illegal circus owners of Bolivia. Even after an undercover investigation by Animal Defenders International exposed the deplorable conditions under which circus animals lived — and often died — and the circuses were banned, circus owners defied the law and continued the inhumane practice. LION ARK tells the compelling story of one group that daringly, defiantly and compassionately took on the task of removing every last circus lion in Bolivia and placing each in a home where they could thrive. It's impossible to not be moved to tears by the horrendous treatment and abuse of the animals. As such, I found it equally impossible to not want to hug and cheer and support the team as they took on the hostile circus owners — as well as the hostile terrain — and successfully transported the 25 African lions across the world from Bolivia to safe haven in Colorado. What I loved most about the movie: I found the story truly amazing and surprisingly uplifting. Just imagine the logistics of moving 25 wild beasts who have been tortured and neglected their entire lives across the world, first by vehicle, then by plane. The story and its filming are incredible, admirable, humbling, moving, tear jerking, heartwarming. The members of the ADI team and all who helped make the amazing feat a reality did it out of love for the animals, not as a publicity stunt nor as fundraising fodder. The impressive group made — and continue to make — a difference in a way most of us never dream of, likely have never even heard of. Even as a resident of Colorado, someone living fewer than a hundred miles from where the lions were transported, I never knew this story until viewing the film at the STARZ Denver Film Festival in November. I'm honored to have had the eye-opening opportunity. What I didn't like so much: The film is fabulous, the story riveting. The pain inflicted upon so many animals, though, is at times very hard to watch. Not just the lions, but elephants, monkeys and more. Such scenes are thankfully few. And watch them we must as ignorance helps no one, least of which the animals that continue to be mistreated. My heart hurt after certain scenes of abuse, but the joy of the lions upon release into their new territory made it worth it. LION ARK has been lauded at film festivals across the globe. It's not yet available in theaters or on DVD, though it will be screened at a handful of upcoming festivals. When it becomes widely available, I encourage you not to miss it. And watch for it to be named at upcoming awards shows, as I have no doubt it will be recognized at at least a few. LION ARK is not rated. 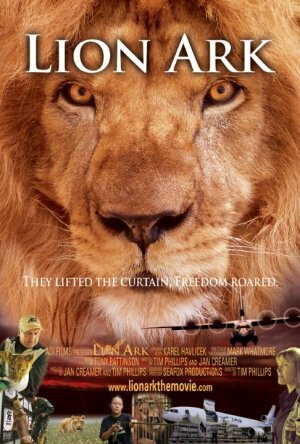 Find more information on the film, the animals, the team at LION ARK The Movie. You can also follow the LION ARK story on Facebook and Twitter. What did you know of the LION ARK story before this review?